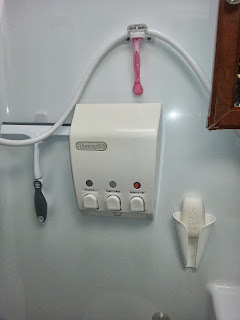 THE ROMANY LIFE: Our Camper Bathroom Is Bullet-Proof! 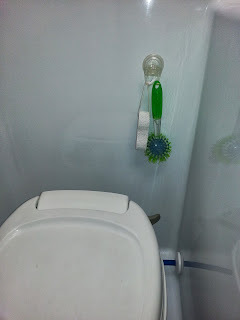 Bathrooms are big deal to RVers. It's the one big convenience that sets us MILES apart from tent camping. It's what allows Mom and the kids to get into camping. It's all about the bathroom baby, and make no mistake! Our bathroom is teeny. While it is Lance Camper's "Largest Wet-bath" it is still teeny compared to other RV bathrooms. We don't mind. Our bathroom has features that some people might think are the opposite of "features". For example: Our bathroom has no carpet in it. Now why someone would want carpet of ANY sort in a bathroom is beyond me. It's just not a carpet kind of place for OH SO MANY reasons. Had ours come with carpet, we would have paid to take it OUT. Our bathroom does not have a separate shower/bathtub. For one thing, most people do not take TUB baths, unless there are small children involved, then a small tub would be useful. Our shower IS the bathroom. 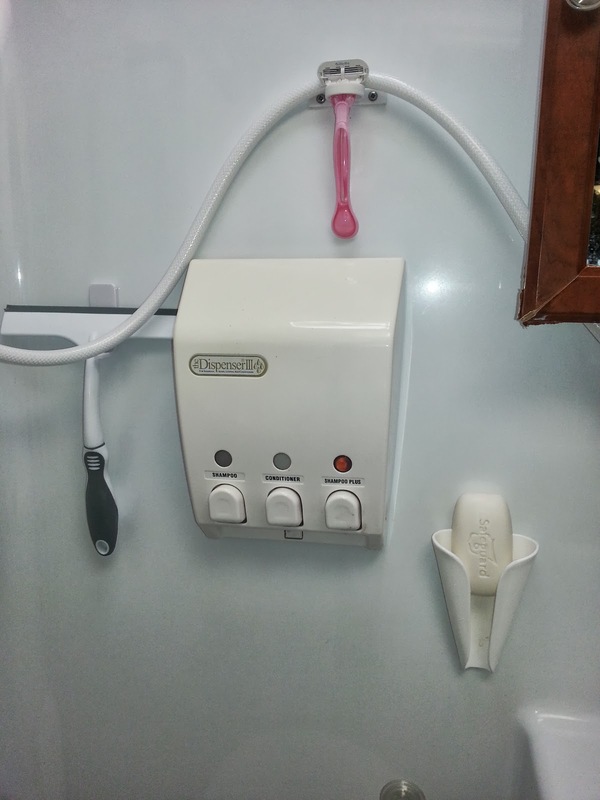 You can see our shower hose hanging on the wall behind the soap dispenser. If there is any inconvenience, it is the need to squeegee the shower down after using it because it leaves the bathroom (and toilet) soaking wet. Now that might seem terrible, but it's really not (note the squeegee hanging on the wall). It takes, literally, about 90 seconds because the bathroom is - well -TEENY. When you remind yourself the #1 enemy in an RV is MOISTURE, allowing all of that water after a shower to evaporate is a BAD idea even in a luxury motorhome. Moisture + RV's = BAD STUFF. Do you hate cleaning the RV toilet? I used to. I don't anymore. I do it while I take a shower. Guess how easy it is to make the bathroom sparkling clean when there is soap and water sloshing all over it during the shower? Well, that more than made up for the time I spent with the squeegee, and our RV bathroom is one of the few I have been in that DOESN'T stink. It simply gets hosed down too much with soap and water for anything to start stinking!